Our Last One: Building a 8th Edition List! I mentioned in the previous exercise, that I was going to take a look at our other competitive archetype: Drop Pods. I'm not going back on that promise, especially after the significant interest in proper drop pod techniques and players looking for list building help on the B&C Forum. I've even gotten emails requesting that I dig deeper into their secrets. Feel free to take a look at my Drop Pod tactica on the BT Tactics page, as well as the in depth tactica for this specific army on this page. What I can do now, however, is help you understand the mechanics of the BT drop pod army list. With that being said, the list we'll be looking at here isn't the only way of doing things. Feel free to experiment, but remember to follow the tenants of 8th Edition as described in the previous exercise. As you can see, this is the Defensive Drop Pod list found on my army list page. It is originally inspired by Stelek, but I adapted it for 2k points. The final list you see here was made possible with assistance from BigDunc and Doomarn. It is, in my opinion, the second best competitive BT list that I've seen (and played). The problem is that it costs quite a bit to build up. You need 11 drop pods to start, then toss in the 3 land speeders, 3 dreadnoughts, Emperor's Champion, 2 Commander models, 2 Command Squads, and 30 marines. Fortunately, you can use any combi-melta model for the Commander and all you need really from the Command squad boxes are the Apothecaries. Looking at quite a bit of money (~$750 without the BT upgrade kits or the Forgeworld Dreadnought Drop Pods) to build the army from scratch. Still, if you have disposable income available to you, this is the army to buy. It is highly adaptable to any scenario you are playing, can take all-comers, and has enough firepower to dictate the flow of battle. We'll take a look at the list more in depth. However, be wary that this list will likely become obsolete when the Black Templars receive a codex update. Games Workshop will presumably follow their trend and give the BT the new "Drop Pod Assault" rules, making your Drop Pods useless. Still, we're quite a ways from a new codex, so the army does extremely well for now. Because you want to win, that's why. This list can, and will, win games against the toughest tournament lists out there on the internet. It has the ability to win tournaments and take home that 1st Place prize. I'm going to explain how it accomplishes this goal, by taking it apart and dissecting the little pieces. The list itself is deceivingly simple and that is its strength! We'll take a look at the HQ first. 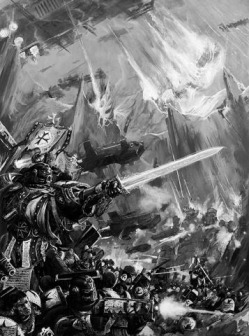 Every army needs a HQ and more times than not, the Black Templars have select the Emperor's Champion as one of them. As my seasoned readers will notice, I very rarely take the other HQ units in my army. I've been asked why I do this and it primarily comes down to points cost. What I gain from taking another HQ is usually not as much as I would gain from taking a Predator or a couple of Land Speeders. However, this is not one of those times. By taking the Castellan, we unlock the Command Squad and the dual-meltaguns that are available to those units. If you add in the Castellan's combi-melta, there are 3 possible melta shots in a given turn. In addition, the Apothecary provides Feel No Pain to the entire unit, making it much more durable. We're taking two of these units in Drop Pods to provide a meaningful distraction and objective denial unit. They'll be tough to eliminate and have the ability to put out some nice damage, especially against vehicles. You'll also have some basic CC-utility because the Castellans are armed with Power Weapons. Our EC will be taking the "Accept Any Challenge" vow, but we'll get into why in a moment. Attach him to one of our Crusader squads and we'll be set to go. The EC will provide a close combat boost to one of your units, as well as providing Ld 10 to that squad. Next up, the Elite slot. This slot contains much of our hard hitting power in the list. We're taking 3 Dreadnoughts in Drop Pods with Assault Cannons and Heavy Flamers. These will strike fear into your opponent and wreak havoc in their lines should they land where you want them to (preferably in cover if its available). Are you fighting mechanized Space Marines or Imperial Guard? No problem! Drop them in your enemy's backfield (hopefully all at once), blast a few vehicles, and laugh at them when they scramble to eliminate the threat. Facing a horde or footslogger army? That's okay too. Just blast away! In combination with your other units dropping in, your opponent will be sorely pressed to decide which units to deal with, especially if you were careful with their deployment. One dreadnought is sacrificial and easily dealt with. Three will force your opponent to split their fire, or risk being destroyed by the remaining two dreadnoughts. Once your opponent's turn has gone by after the drop, you'll be able to move and assault vehicles, infantry, or whatever else suits the situation at hand. As with all of our other competitive lists, redundancy is important, so having three dreadnoughts is a must here. What is a list without Land Speeders? Not a competitive one, at least. We're taking 3 squadrons of Land Speeders with Typhoon Missile Launchers. These will come in from reserve to support to your Dreadnoughts from a safe distance. These have the range to remain effective fire-bases, which will keep all but high-end weaponry from taking them down. Not only that, they can remain mobile and easily reach anywhere on the board that is needed. Besides which, they provide excellent synergy to the list and give you an unit which is able to fulfill multiple roles on the battlefield (read: Duality!). If you have some surviving near the end of the game, use them to contest your opponent's objectives. The list contains 3 Assault Cannons, 12 Meltaguns (2 are Combi-melta), 3 Heavy Flamers, 3 Heavy Bolters, 6 Missile Launchers, and 32 Bolters. There is extreme duality in this list. All delivered by the 3/6/3 redundant units in the Elite, Troops, and Fast Attack slots. That's Too Simple to Be Competitive, Right? Wrong! We have the list. We also know why we took each thing in the list. What we don't know is how to use the army! Sure, you can take the list and build it. But it won't do you any good unless you know what to do with it in battle. I hope to dispel some of the mysteries in this section, but again, I cannot possibly give you everything you need to know. Experience is the best teacher, all I can do is guide you down the correct path. The first thing I need to talk about is why Drop Pods are competitive. I'll do this in a simplified manner, as I've already discussed it in the Tactics section of the website. You can also find the in depth "How To" tactics article on how to use this army list here. However, it won't hurt any to highlight the important concepts. The reason why I believe that our Drop Pod armies are so competitive in today's 5th Edition environment is primarily because we use 4th Edition rules. What does this mean for players? It allows us to keep our entire drop pod force in reserve until the 2nd turn, at which point, all units become available as per normal reserve rules. In the newest 5th Edition codices, you are forced to deploy half of your drop pods (rounding up) the first turn of the game. This gives your opponent the ability to plan for your the rest of your army's arrival. It also provides them with limited targets in which to fire their weapons. With the weight of fire from your enemy's entire army concentrating on a small part of your force, your units will surely be quickly eliminated. The Black Templars don't suffer from this. Staying in reserve at least a turn longer also has another advantage: it forces your opponent to lose at least a turn of fire. It is extremely difficult to kill marines as it is, so losing turns is bad for your opponent. However, we have 43 marines in the list and provide 28 possible KPs to your enemy. Fortunately, MSU (Multiple Small Units) is our friend in this list. We provide no large targets and all of our units are redundant with exact units elsewhere on the board. Kill a crusader squad? Good for you! I have 5 more just like it! Another reason Drop Pods give the Black Templars a competitive archetype is that there is built in mobility in the force. When you drop in, you lose that mobility, but you get to choose where that spot is with relative accuracy. This allows you to castle up, block movement lanes, claim/contest objectives (you have the resources to get to ALL of them), refuse flank your opponent, deploy to your enemy's fragile flanks, etc. They also provide a defensive structure for your army to hide behind. They are relatively fragile with their AV12, Open-Topped status; however, they provide cover for your infantry and while they are alive, prevent your opponent from moving within 1" of them. So you get why we're taking Drop Pods, but now you need to know how to use them. Obviously, the situation at hand will merit different choices for a player, but you will likely find yourself facing a common defensive measure against Drop Pods: Castling. This involves packing their forces as close together in a small portion of the board until the Drop Pod player starts coming in from reserve. This prevents your pods from dropping in the midst of your enemy's army. There is a problem with this strategy and that is it causes the player to play catchup the rest of the game. That is a good thing for us though, as they have to use extreme mobility to contest the objectives we've just captured elsewhere on the board. If facing a castled opponent, you'll want to box them in as best as possible. Be wary of where you place your pods, however, because if you scatter off the board, you'll suffer a mishap. For example, if your opponent is crammed into a corner, you'll want to place your units (ideally your Dreadnoughts and/or Command squads) in front and sides of their forces to block their movement out. Obviously, you don't want to put just a couple units out there to get killed. They require support from the rest of the army, but if you can box your opponent into that corner with a few dreadnoughts, crusader squads, and/or command squads, you'll control the rest of the board with the remainder of your forces. Another defensive strategy your opponent may employ is to move to the center of the board, or to objectives (wherever they may be). This is a bit more tricky to counter, as we need to split our forces around the board. Once we enter the battle, the only things with great mobility is the Land Speeders, so you're pretty much stuck where you land. Fortunately, because your opponent has split their army up and is likely strung out, we can pick apart their army's flanks piecemeal at our leisure. Find the vulnerable point in their forces, deploy the appropriate resources, neutralize the threat, and move on to the next target if possible. Now, if your opponent does neither of these, you should have a pretty good idea of what to do. Dreadnoughts in their face, with support from the command squads, and the crusader squads come in to help if needed. The Typhoons can do their damage from ranged positions. This distraction force will reap a very nice tally of kills while the rest of your forces are claiming the mission goals. Try to drop your pods into terrain if possible to give you cover. Because you're landing the vehicle into terrain, it will count as dangerous terrain, and on a D6 roll of a 1, the Drop Pod is immobilized. But because it already is immobilized, you would lose it's weapon instead. Still, a 1/6 chance of losing the drop pod's weapon is a price I'll gladly pay for cover upon landing. So what have we learned? Generally speaking: throw your hard units (i.e. Dreadnoughts and Command squads) into your opponent to distract them and provide huge threat to their backfield. Support them with Crusader squads and a few Land Speeders to give your opponent targeting problems, thus, increasing the Dreadnought's chances at survival. Use the rest of your force to contest or claim the mission goals (usually objective or table quarters). Adjust this as necessary. Sometimes its advantageous to pod in all of your units into your enemy's face and blast away. Experience will tell you what is appropriate for the situation at hand. Be sure to continue on to Part Three: Assembling Your Crusade!